Found! The missing sign is recovered! 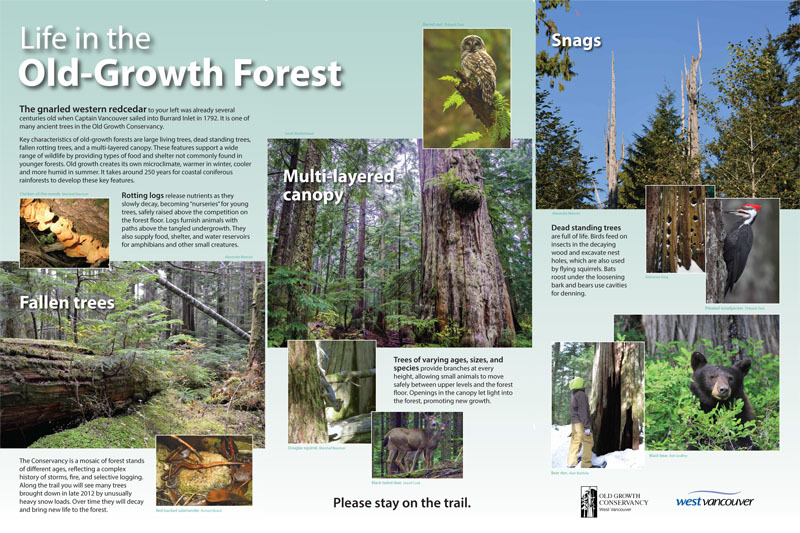 Earlier this year two interpretive signs were erected on the Conservancy Crossing Trail by DWV Parks and the Old Growth Conservancy Society. A week later they were gone, taken by some misanthrope. The area was searched by dedicated OGCS Directors, primarily Alexandra Mancini and Marshall Bauman. Their efforts were rewarded when Marshall found one sign in the brush near Parking Lot #5, however the whereabouts of the second sign remained a mystery. If you look carefully you’ll see the 2 black posts of the sign shining beneath the brush. The sign was carried back to the Conservancy Crossing Trail and out to the parking lot where celebratory snacks and spiced apple juice were enjoyed. The sign is now safely in storage, waiting for re-installation, hopefully this year and definitely with more secure footings. Stay tuned. Many thanks go out to Alexandra who organized the search and to Marshall and Herb for their sharp eyes. Bill McCuaig was a man of many talents and activities. He was a person who was friends with everyone and everyone became friends with him. His love of being with people, his love of music, just being in the country, or in the woods and in the creeks was all part of his life. 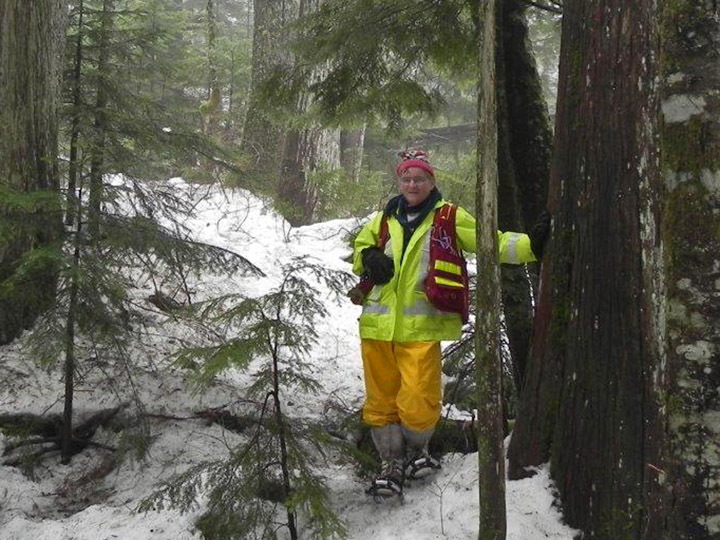 These activities led him to a career in forestry where he was able to apply his knowledge and energies in his work with the District of West Vancouver. During his employment he not only found time to get his Masters Degree but also to generate a love and understanding of the value of the old growth forests of West Vancouver among his peers and friends. Bill has expressed his love of the forests and especially the Old Growth Conservancy since he left the District. Much of his time has been spent with his interests in the Squamish Nation’s work and working with the Old Growth Conservancy Society on their many projects. 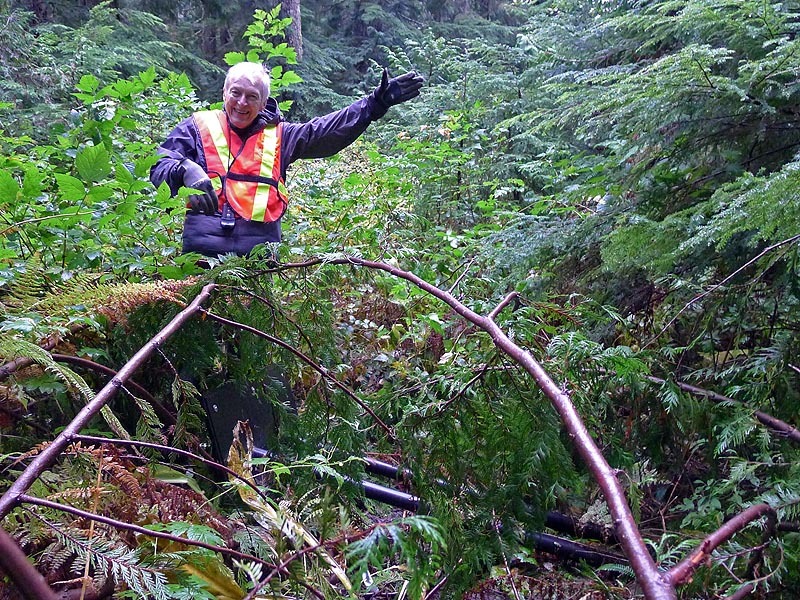 The sudden death of Bill on June 20th 2014 at the age of 64 came as a hard blow to all of us in the Old Growth Conservancy Society, but also to his many friends with whom he had worked and laughed with over the years. He has left a huge hole in our lives and thoughts. Not until his death did we realize how much he meant to each of us and how much he was a part of everything we do in the Conservancy. His indomitable love and knowledge of the old growth forest not only gave us inspiration, but fostered in us the desire to always know more about the great forest of the Conservancy. He was always gentle in his way with people, and always ready to help with a large smile on his face. Bill was not only a wonderful friend to us all, but an invaluable member of the OGCS and a trusted advisor in all the work we do in our Society. The two interpretive signs erected on the Conservancy Crossing Trail by DWV Parks and the Old Growth Conservancy Society went missing earlier this year. 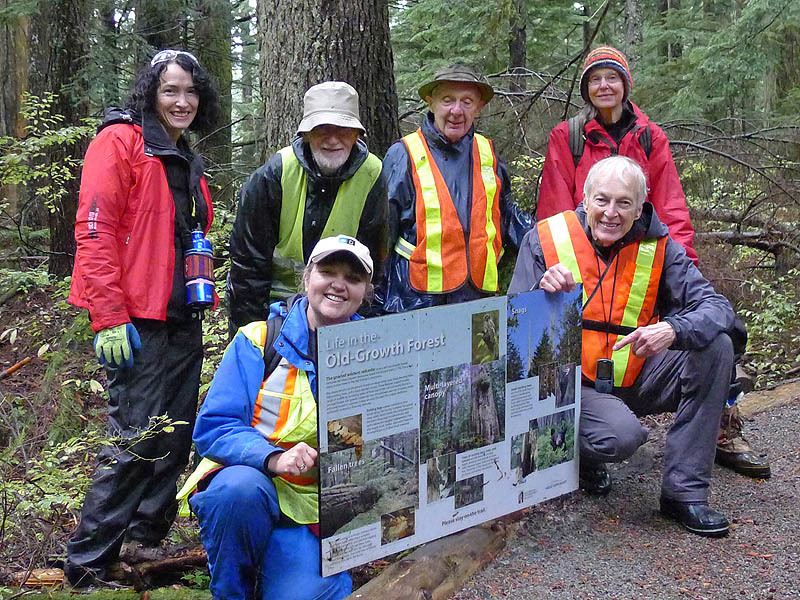 One sign was found thanks to the dedicated OGCS Directors that searched the area near the trail. It’s time to look for the second sign.We’re organizing a search party on Saturday, Oct 25th. Let us know if you can join the search. We’ll meet at Parking Lot #5 at 10 AM and be in the woods for a few hours. As always, dress appropriately for the weather. Sturdy footwear is required. Bring water and possibly a snack. Hike at your own risk.